I’ve had this app for years without issue and ever since our last day off due to weather this app has been sending me open statuses almost daily. It stops for a few days and then starts again. I’ve gotten them on Saturday’s so not just M-F. The settings tab never opens up, the app just thinks and thinks and then settings tab goes away completely. I reported this in May initially. Please fix this app! Thank you. Successfully communicates operating status daily, whether you want it to or not! I have my settings configured to NOT provide a nightly alert and it does anyway. 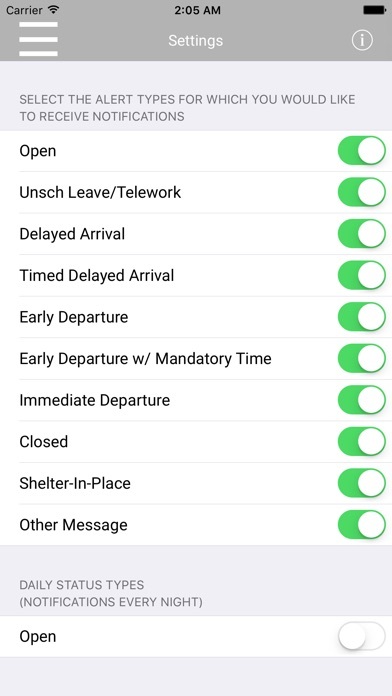 I also have the individual alerts sets to NOT alert me if status is OPEN. Yet every night a get an alert that it's open the next day. Assuming that most people are primarily interested in closures for weather or other reasons, you should probably make the settings work so that you can actually only be notified of closures. Sends a notification of operating at status EVERY night just past midnight. Not useful. Doesn’t send alerts. No better than getting on the Internet and checking the OPM website. A perfect metaphor for our government - it doesn’t work as advertised. Please make it iPhone X compatible. Have had it for at least a year and it has never once sent a push notification. I checked all settings in the app and in iOS. For notifications I get the OPM emails. They tend to come an hour late but at least they come, and then gmail notifies me. Without notifications this app is kind of useless because you might as well just use Safari and go to the OPM website. The stupid thing never sends me alerts. I’ve driven all the way into work (to include today) when it was closed. Every time the same thing...crashes at opening. Possibly because of over use by bewildered federal employees trying to access it at keys times with all the confusion on federal furloughs. But that’s when we need to view it and it doesn’t show updates in a long time. Please check it out for crash enhancements and updates . I’ve used the app on previous phones but now I can’t get to settings anymore. It disappeared from the App Store for a short time in August/September/October. I accidentally deleted the app, and all I got from the App Store was “no longer available in your countries App Store.” I kept on checking the store for it. So glad it’s back. I was worried I’d have to start watching the news again just to get 2017/2018 closures. Are you going to update it? You say you are aware? Are you going to update the app? Myself as well of thousands depend on this app regarding inclement weather. Can you at least tell us if you don't plan on updating? It was an amazing great resource app until the iOS9 came out. I get notified right away. I get up early in the morning, and to see the notification already there, is nice to know what is going on. It serves its purpose. Thanks for getting this working again. It's very helpful for the winter season. Outdated app (last update July 2016). This used to work ok back in the day but they only updated for iOS 8 01/2016 when iOS 9 was already out. Now iOS 10 is out and still nothing. Either take this non-working app down or update it. Figures that the government can't manage anything properly, even a small app. I've noticed if you are watching TV, they know before the APP. But it's nice to have cause if your not watching TV or out, you can still know if you need to go to work or not. It has worked well for my family. 3 stars because the push notifications don't work. I use this app all the time in the winter. Please update this so I don't have to go to the website all the time or wait for the announcement on TV! 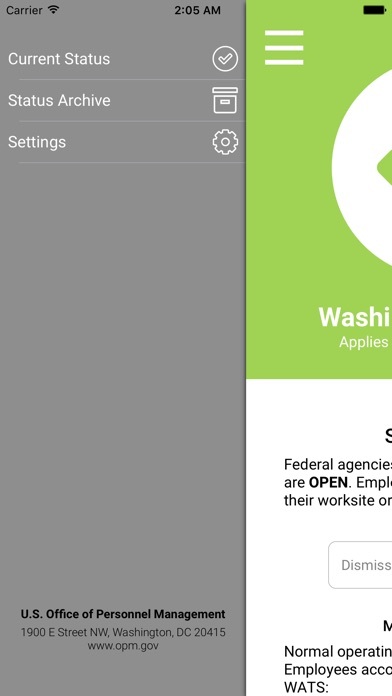 The local news and opm website have the federal government closed tomorrow...not the opm app. When the federal government recommends getting the app for the most up to date info they might want to actually update the information. Way to drop the ball opm. No fix after OS update? Still crashes upon opening. Work as expected alerts are simply and on time. I am aware that u know the app needs updating, but it's been too long for it not to be updated. Let's get it working properly. Really pleasantly surprised to see this updated for iOS 9 with a nice modern design, and in time for the winter season. Will hopefully be updated at least annually going forward. The app is not centered, it's shifted a 1/4in up the screen so you can't press the menu button. So much better and finally works again on iOS9. Thanks again. I agree with the comment on adding in Federal Holidays... That would be a nice feature, even though it is a given. During the big snowstorm in DC, I was happily sipping hot apple cider reading a book while my friends were madly hitting refresh on the opm website to find out if we needed to go into the office the next day. I got a little push notification at the same time they got the news. Thanks OPM! 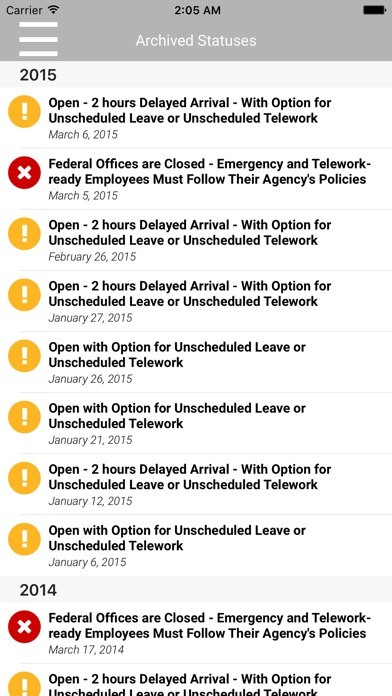 Obviously a pretty useless app if you're not a federal worker or a DC employee whose work schedule is tied to OPM announcements, by if you are - super handy. Only gives status for current day, not future days. Not good enough for planning. Needs to do more than tell you what you already know. I love the app and being able to see the status right away especially now that winter is here. 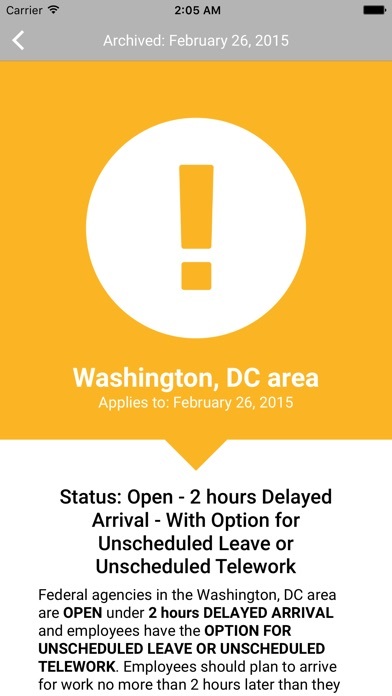 The app helpfully provides notifications on snow days or delays. Please update before the snow comes!!! As stated works pretty good and simple. It does exactly what you would need it to do...Notify you of alerts. It would be nice if the app was able to reflect federal holidays instead of displaying Status Open (which I suppose it is for those required to work on a holiday). Maybe a sprightly different status? Has never pushed alerts always has to be manually refreshed. Now it’s frozen on November 13, 2018. 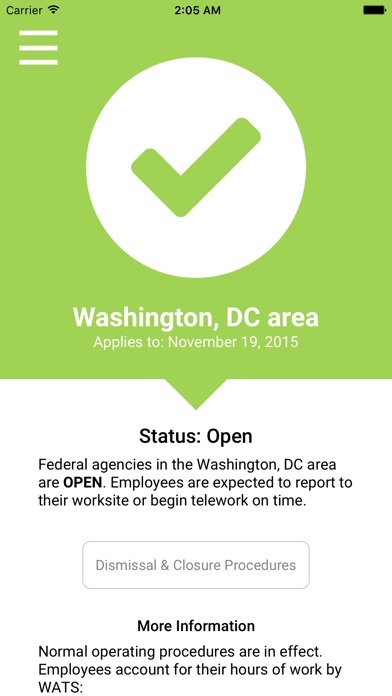 It currently states the operating status for November 13th. It’s now November 15th. Does this type of thing happen often? Questioning the usefulness of this app. The OPM website is also not current. Looks like they need more than one person double-checking this stuff is current every day. Looks really bad. Doesn't push alerts or show correct day. Used to work. And the hits keep on failing. Outdated. Slow. Needs gentle (and constant) prodding to work. Hey OPM... a little love? This is my “Go-To” App. One stop shop. The easiest way to eliminate the middle-man! Crashes immediately when I try to open the app..... So I’m unable to use it unfortunately. Is it supposed to alert re: operating status EVERY SINGLE DAY?